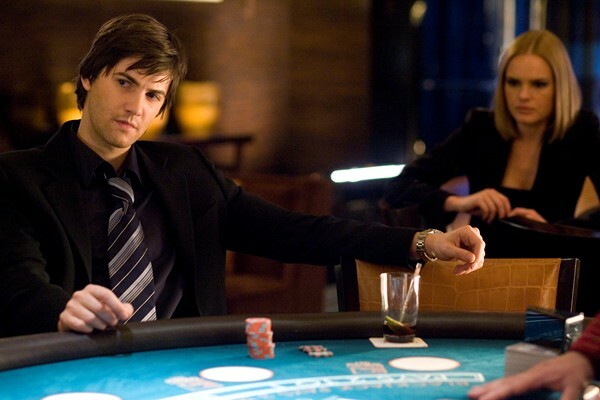 21 is loosely based on the best-selling book “Bringing Down the House“, by Ben Mezrich, about a group of MIT student who go to Vegas and make a killing counting cards. However, the movie’s basic premises isn’t that much different than that of “Risky Business” where an inexperience Joel Goodsen, played by Tom Cruise get a crash course in life experience by running a sort of brothel. In 21, Ben Campbell (Jim Sturgess) is our Joel Goodsen. His sheltered life as the smart well behaved kid has gotten him into MIT and Harvard medical school, but he lacks a real life experience. Harvard won’t grant him the $300,000 scholarship, because while he does have the grades his life story does not dazzle. In other words. he’s just other smart kid, who haven’t done anything or taken any risk. While he gathers the money to pay for Harvard, working an $8 an hour job, he attends MIT and spends time with his other nerdy friends: Miles Connolly (Josh Gad), who looks and acts like Jonah Hills’ nerdy brother, and Cam (Sam Golzari). Ben stands out in his math class and is notices by his professor Micky Rosa (Kevin Spacey) who approaches Ben about joining his math club: a card counting crew made up of four other students: Jill Taylor (Kate Bosworth), Fisher (Jacob Pitts), Choi (Aaron Yoo) and Kianna (Liza Lapira). Ben refuses, but soon joins, when Jill, the girl of his dreams, lurking him in. Soon Ben is flying every weekend to Vegas and making more money than he could ever imagine. That is until Cole Williams (Laurence Fishburne) a security consultant for the casino, who business is near extinction because of facial recognition software, gets in his way. If this film were a mixture between “Risky Business” and “Rounders“, it could have been a classic, but it ends up just being ordinary. The pacing of the movie is off and the movie runs about ten minutes too long. All around, all the actors did a good job. Kevin Spacey was great, but he has gotten use to playing all his characters in the same way, expect for the short time that he is in disguise and speaks with a southern drool. That was brilliant! Lauren Fishburne was the best of all and his performance was marvelous, but he doesn’t get enough screen time. Oddly enough his character is the most developed. What his movie needed what a real conflict which could have been possible if Lauren Fishburne was used more effectively. Overall, as a piece of entertainment, it’s an acceptable movie, but you’ll feel you got served a hamburger and fries when what you were expecting was steak and potatoes.